Al Noori Library has come a long way over the years. 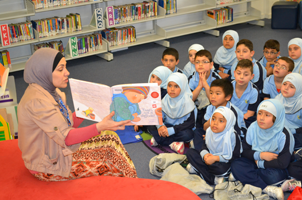 Our students enjoy visiting our library on a regular basis, much to their parents’ delight. Books are being talked about at home and in class. Group readings with the librarian have had a positive effect. Al Noori is constantly looking to upgrade the “heart” of our school with brand new books. We currently use a cutting edge software package to manager all aspects of the Library Administration. We are taking the library into the new age and ensuring our students are getting the best resources on offer. Some of our new resources are compliments of a successful Bookfair event this year which managed to raise considerable funds. With the opening of the New Library in the Secondary campus, I would like to Welcome Mrs Sheikh on board. We would like to thank all parents for their great support throughout the year, especially with our literacy events. You may bump into Wally who will find you a book to read. come join me and soon ou will very much agree!